We recently wrote about how different the feeding therapy experience can be and how confusing it is for parents who may be simply handed a referral. One mom who described the eight months her son was in a behavioral feeding therapy program as “traumatic for us both,” was furious to learn that she had options. Her son thrived after a tongue-tie release procedure and responsive therapies that worked on healing his reluctance (worsened by coercive feeding and therapy), supporting appetite and decreasing anxiety. Most of our clients have “failed” months or years of various feeding therapies. Jenny was the 6th feeding therapist for a 3 year old client she worked with recently who made more progress in six weeks than he had in the three previous years. When you don’t know much about a program, and the website uses language that is confusing, or you don’t get a clear idea of what kinds of therapies they offer, you may need to dig further to find out if a therapist or program is a good fit for your family. 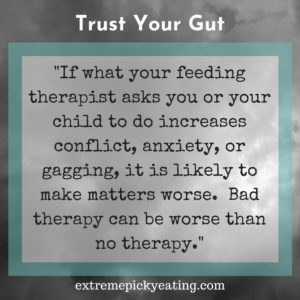 Here are some questions you can ask and discussion points (link here: Finding Your Feeding Therapy Partner PDF) Of note, these are complex issues, and we go into this in depth in chapter eight in our book, Helping Your Child with Extreme Picky Eating. Sometimes, even if you are contemplating formal therapies, you can make progress at home. We practice Responsive Feeding and Therapies with our STEPs+ approach (including links if you’d like to learn more). How do you describe your approach to feeding therapy? Do you believe that children are capable of self-regulating intake, even with challenges? Or do you think that we have to monitor and enforce quantity minimums or teach portion control? How long have you been doing feeding therapy specifically? From whom did you learn? Where? Do you have specific training to address oral motor issues (if interviewing an occupational therapist or OT) or will a qualified speech-language pathologist (SLP) evaluate my child? Can I observe or watch a video of a treatment session? How do you handle a child who refuses to participate? How do you present food? Is it served as an option (family style) or as one thing he has to eat? Do I bring my own food? Do you have food options to help me? What kind of parent support and education do you offer? How do you help families integrate your advice at home? What can you offer if any of your suggested techniques result in conflict or a power struggle? Can you connect me with a few parents with whom you have worked? How will we know when we are finished with therapy? Necessary and good therapy can be incredibly helpful. Bad therapy can make matters worse. You could also ask to join Mealtime Hostage private facebook group. With over 6,000 parents, they are often able to suggest resources in your area, and also support a Responsive approach.